I didn't own a computer until the mid 80's (my first was a Kaypro) and really didn't know too much about them or what I could do with one. Having owned a 2600 since the late seventies, I was down with Atari, but never made the leap. I loved my 2600 and had I known the graphics capability of the Atari computers, I'm sure I would have sold my soul to afford one. The Atari 8-bit family is a series of 8-bit home computers manufactured from 1979 to 1992. All are based on the MOS Technology 6502 CPU and were the first home computers designed with custom coprocessor chips. Over the following decade several versions of the same basic design were released, including the original Atari 400 and 800 and their successors, the XL and XE series of computers. Design of the 8-bit series of machines started at Atari Inc. as soon as the Atari 2600 games console was released in late 1977. The engineering team from Atari Grass Valley Research Center (originally "Cyan Engineering") felt that the 2600 would have about a three year lifespan before becoming obsolete. They started "blue sky" designs for a new console that would be ready to replace it around 1980, three years after the 2600's introduction. What they ended up with was essentially a "corrected" version of the 2600, fixing its more obvious flaws. The newer design would be faster than the 2600, have better graphics, and would include much better sound hardware. Work on the chips for the new system continued throughout 1978 and primarily focused on much-improved video hardware known as the Color Television Interface Adapter, or CTIA. During this gestation the home computer era began in earnest in the form of the TRS-80, Commodore PET, and Apple II family - what Byte Magazine would later dub the "1977 Trinity". Ray Kassar, the then-new CEO of Atari from Warner Communications, wanted the new chips to be used in a home computer to challenge Apple. In order to adapt the machine to this role, it would need to support character graphics, include some form of expansion for peripherals, and run the then-universal BASIC programming language. The need for character graphics led to the introduction of the ANTIC, a co-processor that ran in concert with the CTIA to provide graphics. Like the earlier TIA of the 2600, the CTIA was designed to produce sprites and nothing else. ANTIC was built to generate conventional bitmap graphics and characters, providing a number of different modes with varying color support and resolution. ANTIC and CTIA worked in concert to produce the complete display. Management identified two sweet spots for the new computers, a low-end version known as Candy, and a higher-end machine known as Colleen (named after two attractive Atari secretaries). The primary difference between the two models was marketing; Atari marketed Colleen as a computer, and Candy as a game machine (or hybrid game console). Colleen would include slots for RAM and ROM, a second 8 KB cartridge slot, monitor output (including 2 more pins for separate luma and chroma) and a full keyboard, while Candy used a plastic "membrane keyboard" and internal slots for memory (not user upgradeable). At the time, the Federal Communications Commission (FCC) mandated that signal leakage in the television frequency range had to be extremely low. As the Atari machines had TV circuitry inside them, they were subject to this rule and needed to be heavily shielded. Both the 400 and 800 were built around very strong cast aluminum shields forming a partial Faraday cage, with the various components screwed down onto the internal framework. This had the advantage of producing an extremely sturdy computer, although at the disadvantage of being expensive and complex. The FCC ruling also made it difficult to have any sizable holes in the case, which eliminated expansion slots or cards that communicated with the outside world via their own connectors. Instead, Atari designed the Serial Input/Output (SIO) computer bus, a daisy-chainable system that allowed multiple devices to connect to the computer through a single shielded connector. Although the 800 included internal slots, they were reserved for ROM and RAM memory modules. Atari had originally intended to port Microsoft BASIC to the machine, as had most other vendors, intending to supply it on an 8 KB ROM cartridge. However the existing 6502 version from Microsoft was 12 KB, and all of Atari's attempts to pare it down to 8 KB failed. Eventually they farmed out the work to a local consulting firm, who recommended writing their own version from scratch, which was eventually delivered as Atari BASIC. The machines were announced in late 1978 as the 400 and 800, although they weren't widely available until November 1979, much closer to the original design date. The names originally referred to the amount of memory, 4 KB RAM in the 400 and 8 KB in the 800. However by the time they were released the prices on RAM had started to fall, so the machines were instead both released with 8 KB. As memory prices continued to fall Atari eventually supplied the 800 fully expanded to 48 KB, using up all the slots. Overheating problems with the memory modules eventually led Atari to remove the module's casings, leaving them as "bare" boards. Later, the expansion cover was held down with screws instead of the easier to open plastic latches. The Atari 400, despite its membrane keyboard and single internal ROM cartridge slot, outsold the more feature rich Atari 800 by some margin. 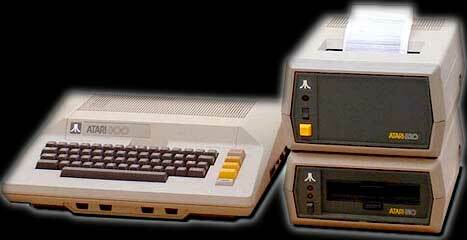 Because of this, developers were generally unwilling to use the 800-only right cartridge slot. Overall, the Atari 8-bit computer line was a commercial success, selling two million units through 1985.